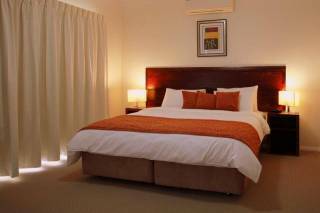 A comfortable room above the cellar door, with ensuite bathroom and small balcony looking out over the vineyard. Contains a queen size bed, small fridge,TV, CD, DVD and reverse-cycle air conditioning. Full use of all facilities and a Free Wine Tasting at our Boutique Cellar Door. Continental style breakfast provisions also included. Luxury self-contained cottage with two bedrooms. Floor to ceiling windows along living area onto verandah with spectacular views overlooking vineyard to hills. Well-equipped kitchen, open plan dining, lounge, log fire in Winter, 15 Metre Salt Water Swimming Pool, Tennis Court & accessories, Undercover BBQ Area, children's playground & accessories, .Free Wine Tasting at our Boutique Cellar Door. Luxury self-contained cottage with two bedrooms. Floor to ceiling windows along living area onto verandah with spectacular views overlooking vineyard to hills. Well-equipped kitchen, open plan dining, lounge, log fire in winter. 15 metre Salt Water Swimming Pool, Tennis Court & accessories, Undercover BBQ Area, childrens play ground & accessories. Free Wine Tasting at our Boutique Cellar Door. 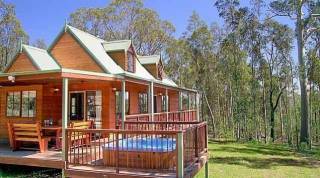 Luxury self-contained cottage with two bedrooms. Floor to ceiling windows along living area onto verandah with spectacular views overlooking vineyard to hills. Well-equipped kitchen, open plan dining, lounge, log fire in Winter, 15 metre Salt Water Swimming Pool, Tennis Court & accessories, undercover BBQ Area, children's playground & accessories, Free Wine tasting at our Boutique Cellar Door. 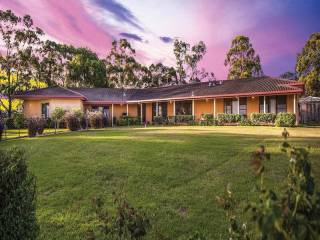 Nestled in a bend of the Hunter River at Luskintyre,Tranquil Vale has three luxury, well-appointed two-bedroom, fully self-contained cottages with AAA 4-star rating. We also have a Loft apartment with ensuite that sleeps 1 couple. 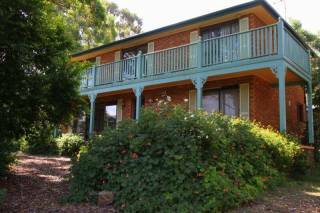 Lawns and gardens surround each cottage and mature shrubs and trees provide privacy. Floor to ceiling windows and French doors open from the living area on to the verandah, with spectacular views over the vineyard and the Hunter River valley to the hills beyond. Each cottage has an open plan kitchen, dining area and lounge room. There is reverse-cycle air conditioning, an open log fire during winter, CD/DVD player and free to air digital TV. Two spacious double bedrooms comfortably accommodate a family of 4 or 5 and/or two couples. One bedroom has a queen bed and the other a king bed that can also be made into two singles. A third single can be added if required. The cottages have been architecturally designed, with modern features, however the rural appeal of a country setting has been maintained. Each cottage has a two-car carport. This is a spacious room with queen size bed, ensuite bathroom and a balcony overlooking the vineyard. There is reverse-cycle air conditioning, a bar fridge, tea and coffee making facilities, microwave oven, TV and CD/DVD system. Included in the tariff is continental style breakfast provisions for the first morning. We want you to relax and enjoy your time here. Plenty of room on 25 acres to walk, jog, run or ride your bike. Sit on the verandah and enjoy a bottle of wine from our cellar door and cook your own BBQ. 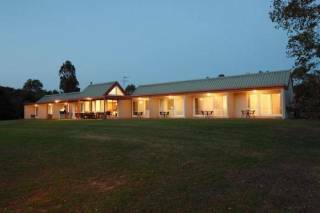 Alternatively, take a 5 minute drive to the newly renovated, family friendly Lochinvar Hotel for a country style lunch or dinner. Pick up provisions from Rutherford (a 10 minute drive towards Maitland), where you have the choice of Woolworths, Coles, IGA or Aldi supermarkets. Gas BBQ - undercover eating area with lighting. You will not have to leave here...or you can enjoy nearby restaurants and cafes on Wilderness Road and Lovedale Road. We are a short drive to all that Pokolbin has to offer including Hunter Valley Gardens, Harrigans Irish Pub, Hunter Valley Chocolate Factory and The Smelly Cheese Shop. You can then leave the hustle and bustle behind and return to peaceful Tranquil Vale. Golf - book a round at The Vintage, East Maitland Golf Club, Branxton Golf Club or Hunter Valley Golf Club. Ballooning - Book directly with Balloons Aloft on 1800 028568. Horse Riding - phone 0249 307111. Terms & Conditions A booking is secured by provision of credit card details. Payment is required when checking out. If a cancellation is made less than 10 days prior to the booking a deposit of 50% may be charged if we are not able to re-book the accommodation.